Can you see some of last year’s almond nuts still clinging to the tree? Nature provides a wonderful backdrop to life here in Andalucía. There are the brilliantly coloured wildflowers in Spring, the snowy peaks of the winter mountains and the baking heat of the summer sun. But perhaps the most stunning display of them all is happening right now – the blossom of many thousands of almond trees carpeting the valleys and slopes like freshly fallen snow. It´s a sight to behold! This entry was tagged Almond blossom, Andalucía, East of Malaga, Europe, flowers, garden, gardening, gardens, life, Malaga, photography, Spain, travel, white villages. Bookmark the permalink. How beautiful….almost like cherry blossom! Have never seen these either! Beautiful, Marianne. Another favorite from yours. Love the Almond Blossom, so beautiful! very delicate beauty, reminds me of flower faires! Ah yes, flower fairies 🙂 Lovely. Do they have a wonderful aroma as well? 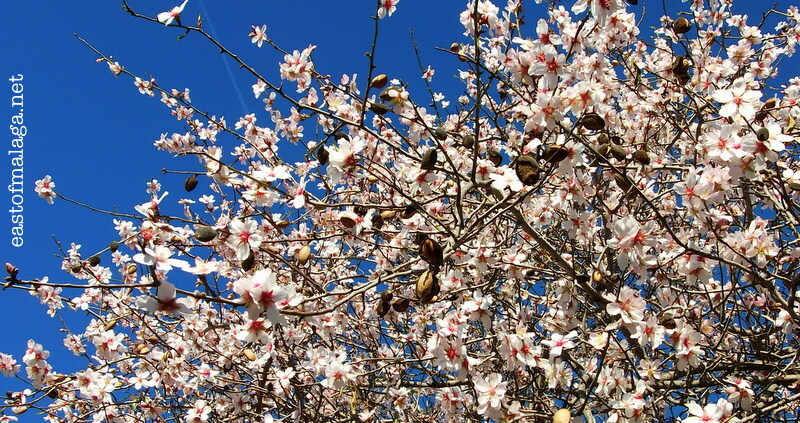 Maybe that’s something you should put on your travel list of things to do, Meg – Almond Blossom in Andalucia in January! Great suggestion – I’m adding it! You’re a few months ahead of Portugal then! One my lasting memories of the Sierra Nevada is a bowl of almond soup. I’ve never managed to recreate it but it was heavenly. Hmmm it’s surprising that we are so far ahead. I would have thought maybe a couple of weeks. Actually, I’ve never had almond soup – I’ll have to look out for that! I’d no idea that almond trees bloomed so early in the year and in pink, no less. Must make for a beautiful countryside, Marianne. We have over 50 almond trees on our land, the majority of which blossom with pale pink flowers, though others have white blossom. I haven’t got to the bottom of what the difference is, other than either variety or natural variation. It certainly does make the countryside very beautiful indeed, John. In comparison, just looking at a grey sky with a pretty damp looking landscape, roll on retirement. I am gonna try and get to Casabermeja this week.. there are thousands of almond trees there.. The flowers look so soft and fluffy. MMM … almonds- i love them. Nice photo Marianne! We have some trees already flowering round here but it is very early as normally in Valencia it is nearer the mid end Feb or even March. If we get it this early it can be a disaster as heavy frosts kill the flowers and prevent fruit form developing…Up until it seems winter just hasnt arrived.Need some rain! Nature is so clever at sorting that out. We rarely get frosts here, near the southern coast. Winter days are usually very mild, though of course, there can be exceptions! Nature is very clever but when we do get bad frosts here the price of almonds goes through the roof .They can lose up to 3/4 of their crop which is devastating. Do hope our almond trees are looking as good! Oh, is it here already? I’m back in Tavira 26th January- wait for me, apple blossom! Really? right now? that is wonderful, I’d love to see and smell it. I feel it should smell, don’t tell me! Yes, right now, Gilly! The blossom is soooo beautiful.